Doug Collins is the Director of The Sherry Lansing Foundation, an organization dedicated to supporting cancer research and education. Doug manages PrimeTime, the Foundation's signature program which seeks to redefine civic engagement during retirement by recruiting volunteers to share their talents and professional skills with students and school leaders. PrimeTime is currently recruiting retired professionals to volunteer at Los Angeles Unified School District campuses. Prior to joining the Foundation, Doug ran two independent production companies under the aegis of Paramount Network Television and was a Director of Creative Affairs within the Paramount Motion Picture Group. 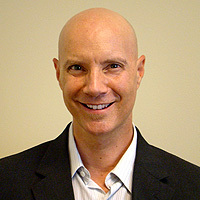 He is delighted to bring his managerial and creative experience to the nonprofit sector. Doug received a Bachelor's degree in Communications from the University of South Florida and has earned a Graduate Certificate from the Applied Gerontology Institute at California State University, Los Angeles.